While Airsoft Guns “Taggers” all perform the same function of projecting a BB towards a target, there are several different mechanical systems that they may employ to accomplish this: Electric (battery) Powered, Spring Powered, Gas Powered, High-Pressure Air (HPA) Powered. There may be inherent advantages or disadvantages to certain mechanisms depending on the style of gun or role in which you wish to employ it. Certain models of Airsoft guns are suited to specific roles or types of gameplay. 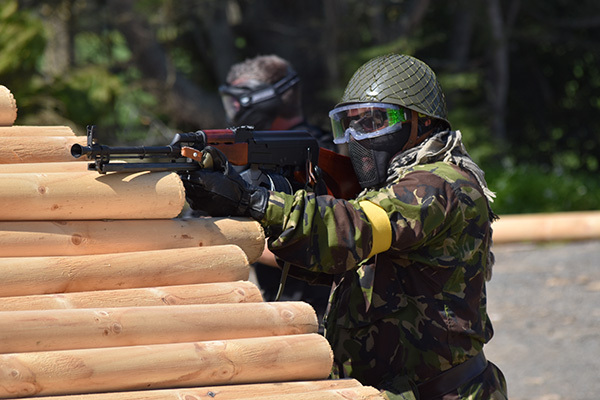 Player uses an electric (battery powered) RPK with a high-capacity drum magazine, this is essentially an AK-47 style support weapon. This configuration allows him to lay down lots of covering fire for his team so they can advance. Spring guns employ a simple cocking mechanism which compresses an internal spring-powered piston. Spring guns tend to be relatively low-cost which makes them attractive for new players, but the downside is that they are very slow to fire, requiring the tagger to be cocked after each BB is fired. A low rate-of-fire is not detrimental in the role of sniper or marksman making bolt action spring rifles a favourite entry-level gun for these players. There are also pump action shotguns which uses a similar system but can fire multiple BB’s at a time. These are still relatively slow to fire and reload but can make good sidearms during close-quarters gaming. One of the benefits of spring-powered taggers is that they require no additional batteries or gas function, which makes them easy to use, maintain and cheap to run. Airsoft Electric Guns are probably the most common type of Airsoft gun you will find at any given Airsoft event. These employ a small internal motor and gearbox to convert electrical energy (from a battery) into mechanical energy. This is then used to pull back a spring loaded air piston which, when released, blows air towards a waiting BB sending it down the barrel. Batteries are rechargeable, a favourite type is a lithium-polymer battery, similar to what is found in many mobile devices and laptops. AEG’s are a relatively robust mechanical design but can be a little overwhelming for some players to service themselves. We recommend sending AEG’s to a local Airsoft retailer for servicing unless you are familiar with servicing them yourself or know someone who is. AEG’s are fairly reliable but can be complex to service. AEG’s are the most commonly used type of Airsoft gun and are used in every style of game play from CQB to open field. The most common type of gas powered Airsoft gun (Tagger) is the pistol. The small design of the gas mechanism makes it ideal for the limited space within a pistol platform. The gas is usually stored within a removable magazine. The gas is either added by way of a small CO2 cartridge or filled from an external tank via a valve (similar to a lighter). Gas pistols are usually low-powered, making them an excellent secondary option to carry for tagging players at close range (see MEDs for more info). Gas rifles are less common but are favoured by those in sneaky roles as they can be quieter than the spring or AEG options. High-Pressure Air (HPA) guns (Taggers) are still relativity new to the sport of Airsoft but are growing in popularity. They are a hybrid of Gas and Electric, using an electric trigger system to regulate an air powered piston. The High-Pressure Air is piped to the tagger from an external tank worn by the player, similar to some paintball guns. These eternal tanks require filling in similar ways to scuba diving tanks. HPA Taggers are proving to offer high-level responsiveness and performance but can be expensive to set up. HPA Taggers can be purchased complete, or players can buy the internal system and install them into compatible AEG shells.